The Elephant Wedding Package is one of our popular wedding styles for a real romantic mood and worth to recall. Combination of Traditional Thai Style Wedding Ceremony with accompanied elephant(s) that makes a stunning backdrop to a romantic and unforgettable marriage experience. Available Wedding Ceremony Package @ Samui , Phangan : Suratthani, Thailand. On the bride and groom's wedding day, starts when organizer staffs (costumers, make up stylists and photographer) meet the bride and groom to dress up and lead them accompany with their followers to wedding place on the beach that was decorated marvelously. We offer a most memorable Buddhist Blessing Ceremony with the preparations of packages offering to the Monks on the sandy beach, set up especially for the occasion. The bride and the groom will enter the ceremony gazebo venue. 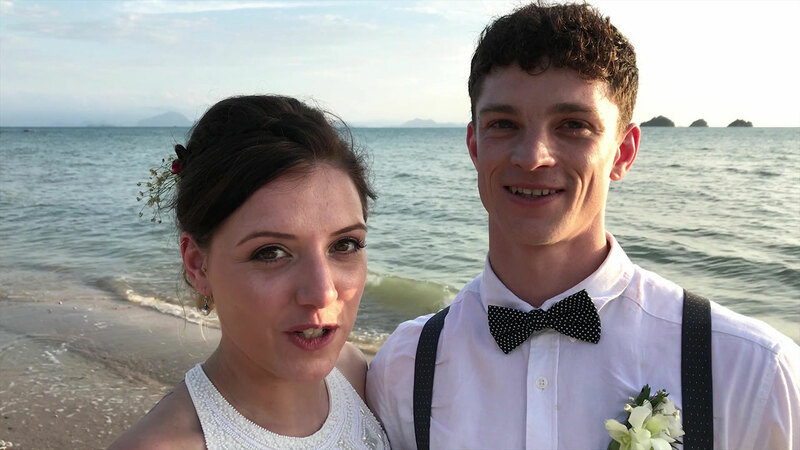 After the couple get inside the decorated gazebo, they will then be seated directly in fromt of the Buddhist Monks. The couple pay respect and offer the package to the monks. Once the offerings have been given, we then move to begin by prayers and chanting by the Monks. You will receive the blessing of the head monk. The Monks will begin chanting. After the chanting you then join hands in poring the holly water from a small bottle into a bronze bowl that you give to the head Monk and will receive the holy water sprinkled lightly all over your body.You will then give the Monks simple offerings to be blessed, and prayers will be said for you and all your family and friends. Then, Bride and Groom sit on elephant's back to the venue. Wedding with elephants rituals are starting to perform by bride and groom are in fromt of the witnesses and elephants. 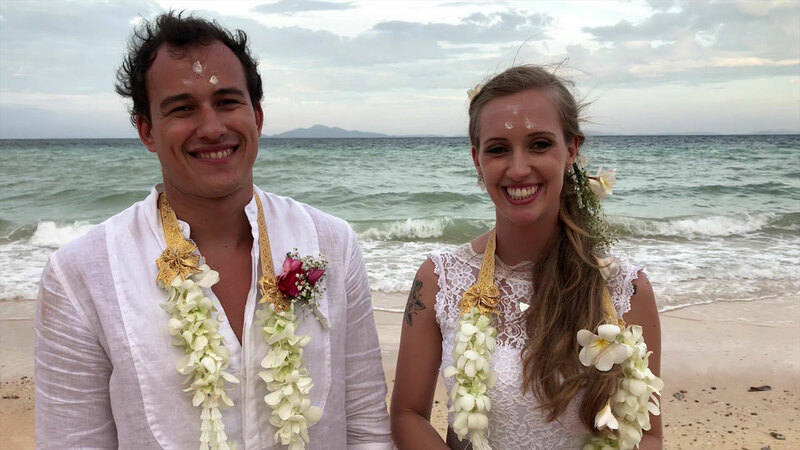 After a warm welcome and introduction by the celebrant, we will conduct several important rituals, including the giving of flower garlands to the couple, painting 3 dots on their foreheads and placing linked head slings upon their brows. Afer completing these rituals, the couple will say their vows and exchange their rings, then all of the guests will take part in the water blessing ceremony using a conch shell to pour sacred water on the couple’s hands for good luck and cool hearts in the future. For the last act, the couple will be entranced by a pair of Thai dancers performing a traditional dance of love. 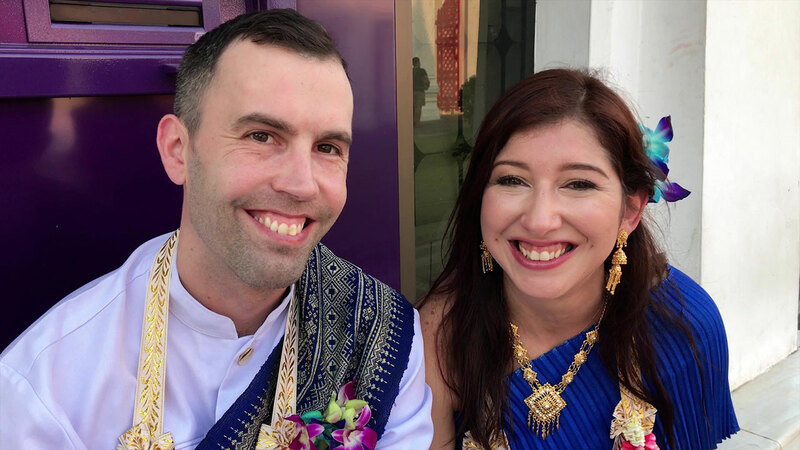 As we move through each element of the ceremony, the Celebrant will explain the symbolism or meaning behind them, which is a wonderful way for the couple and their guests to truly experience the wonder of Thai Culture. Afterthat, the wedding couple ride on the elephants' back to the next step - popped out marriage celebration champagne, plant a memorized tree and wave wedding flags. Wedding couple and their followers soar sky lantern and take photographs. 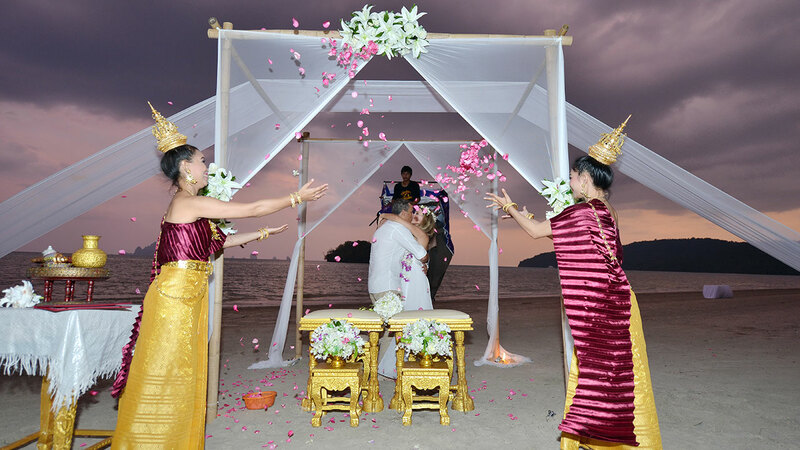 If you are looking for a different and exotic way to celebrate your wedding, our Elephant Beach Wedding Thai Ceremony Style is the perfect way to turn your dream into mesmerizing reality! Venue floral decorations, flower arch and elephant back. 1 accompanied elephant during ceremony. 2 fresh Thai Traditional Flower Garlands for the couple. 3 Buddhist Monks + Fees with blessing on the beach + offering package and temple donations. Thai Wish Dance & Thai Music (Plug-in from iPod or iPhone) playing background during ceremony. Flower petals shower after the ceremony. We are extremely happy with the pictures of our ceremony. He did an amazing job! We also appreciated all the nice things you said in the ceremony... and the girl that helped with Laura's hair was fantastic as well. Thank you so much to all the team you made our wedding day so much better than we ever expected it to be. Everything so well synchronised and carried out to our expectations. The Buddhist monks blessing was a moving experience that we will never forget. The celebrant Noitch was fantastic, he made us feel so special, even including our kids watching via Skype( of which thanks soooooo much for organising). All of your advise along the way and then when we met up at the hotel the day before were invaluable. suggesting to start the ceremony a little later in the day to avoid the scorching heat made for a more bearable temp, the breeze off the water at the gorgeous setting on Bangtoa Beach was just fantastic. Our photos were just lovely and the video so well done with great music selected for us. All in all your company made our wedding like a fairytale, one that we will never forget in a country that we love like our own, we cannot thank you all enough.